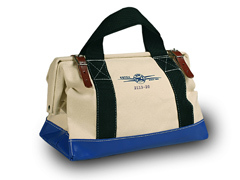 2114 series tool bags are constructed with #8 canvas duck. 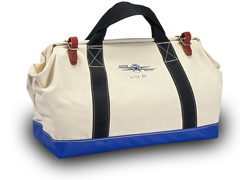 The top opening has a steel frame to keep the bag open and provide security when closed. Two leather straps secure the opening. 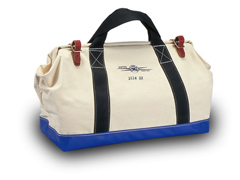 2" web handles wrap around the entire bag fro added strength. They have a "box X" stitch at the top for extra strength. The bottom is reinforced with heavy vinyl coated nylon and has a double tempered masonite board. Six brass studs are placed on the bottom of the bag to protect against abrasion.